You can also download the entire Hamlet translation as a PDF! Give Laertes this money and these letters, Reynaldo. You shall do marvelous wisely, good Reynaldo,Before you visit him, to make inquireOf his behavior. Good Reynaldo, it would be extremely wise of you to ask around about his behavior before you visit him. That was my plan, my lord. Marry, well said, very well said. Look you, sir, Inquire me first what Danskers are in Paris, And how, and who, what means, and where they keep What company at what expense; and finding By this encompassment and drift of question That they do know my son, come you more nearer Than your particular demands will touch it. Take you, as ’twere, some distant knowledge of him, As thus: “I know his father and his friends, And, in part, him.” Do you mark this, Reynaldo? Excellent, good, good. First find out what Danish people are in Paris—who they are, how much money they have, where they live, who their friends are, and how much they spend. And if—through this roundabout and indirect questioning—that they happen to know my son, you’ll end up finding out much more than if you asked specific questions about him. Talk as if you vaguely know Laertes, such as, “I know his father and his friends, and know him a little.” Do you understand all this, Reynaldo? Yes, very well, my lord. “And in part him, but,” you may say, “not well. But, if ’t be he I mean, he’s very wild. Addicted so and so. —” And there put on him What forgeries you please. Marry, none so rank As may dishonor him. Take heed of that. But, sir, such wanton, wild, and usual slips As are companions noted and most known To youth and liberty. You should say, “I know him a little, but not well. I think, from what I’ve heard, that he’s very wild, and addicted to this and that.” From there create whatever lies about him that you can think up. Of course, nothing so bad that it would shame him. Be careful about that. But feel free to make up stories about the wild and crazy things that young men who are on their own typically get into. Ay, or drinking, fencing, swearing,Quarreling, drabbing—you may go so far. Yes, or drinking, dueling, swearing, fighting, going to prostitutes—that sort of thing. My lord, that would dishonor him! My lord, that would bring dishonor on him! ‘Faith, no, as you may season it in the charge. You must not put another scandal on him That he is open to incontinency. That’s not my meaning. But breathe his faults so quaintly That they may seem the taints of liberty, The flash and outbreak of a fiery mind, A savageness in unreclaimèd blood, Of general assault. Oh, no, not if you say it with the right spin. You shouldn’t say that he’s sexually indulgent, that’s not what I mean. Instead, just mention these faults lightly, as if you think they're nothing more than the minor faults that sprout in someone new to freedom—like the products of a strong mind and untamed youth—and the kind of thing that occurs in lots of young men. Ay, my lord. I would know that. Yes, my lord. I would like to know that. Marry, sir, here’s my drift: (And I believe it is a fetch of wit) You, laying these slight sullies on my son As ’twere a thing a little soiled i’ th’ working— Mark you, your party in converse, him you would sound, Having ever seen in the prenominate crimes The youth you breathe of guilty, be assured He closes with you in this consequence: “Good sir” or so, or “Friend,” or “Gentleman,” According to the phrase or the addition Of man and country. All right. Here’s my idea. (And I do think it's a bit clever.) As you casually mention these minor faults and small blemishes as if everyone has heard of them, watch the person with whom you’re talking. If whoever you’re talking to has ever seen Laertes do any of the things you mention, he’ll mark his agreement by saying something like “good sir” or “friend” or “gentleman”—or something like that, depending on the person’s background. And then, sir, does he this, he does— What was I about to say? By the mass, I was about to say something. Wheredid I leave? And then, sir, he’ll …after he does that … he’ll … What was I about to say? By God, I was about to say something. Where did I leave off? At “closes in the consequence.” Ay, marry. He closes thus: “I know the gentleman. I saw him yesterday”—or “t’ other day,” Or then, or then, with such or such —“and, as you say, There was he gaming, there o’ertook in’s rouse, There falling out at tennis,” or, perchance, “I saw him enter such a house of sale”— Videlicet a brothel, or so forth. See you now, Your bait of falsehood takes this carp of truth. And thus do we of wisdom and of reach, With windlasses and with assays of bias, By indirections find directions out. So by my former lecture and advice Shall you my son. You have me, have you not? “He’ll mark his agreement by saying….” Yes, right. He’ll respond like this: “I know the gentleman. I just saw him yesterday,” or “the other day,” or whenever. And he'll say with whom—“and, as you said, there he was gambling,” or “there he was, completely drunk,” or “getting into a fight over a tennis match,” or, possibly, “I saw him going into a house of ill repute”—that means a whorehouse—or some such thing. In this way, make sure your little lie is like bait that lures the larger truth into the open. And that’s how we get wisdom and knowledge, by gradually drawing others in and indirectly finding out what we want to know. Follow my advice and you’ll learn about my son. You understand me, right? God be wi’ you. Fare you well. Make sure to observe him also with your own eyes. I hope he’s studying his music as he’s supposed to. How now, Ophelia? What’s the matter? How are you, Ophelia? What’s the matter? O my lord, my lord, I have been so affrighted! Oh, my lord, my lord, I’ve had a terrible scare! With what, i’ th’ name of God? From what, in God’s name? My lord, as I was sewing in my closet, Lord Hamlet, with his doublet all unbraced; No hat upon his head; his stockings fouled, Ungartered, and down-gyvèd to his ankle; Pale as his shirt; his knees knocking each other; And with a look so piteous in purport As if he had been loosèd out of hell To speak of horrors—he comes before me. Father, as I was sewing in my room, Lord Hamlet came in with his shirt unbuttoned; no hat on his head; his stockings dirty, undone, and hanging around his ankles. He was pale as his white undershirt, and his knees were knocking together. He looked so awful, as if he’d just escaped from hell. Is he madly in love with you? My lord, I do not know.But truly, I do fear it. Father, I don’t know. But to be honest, I think he might be. He took me by the wrist and held me hard. Then goes he to the length of all his arm, And, with his other hand thus o’er his brow, He falls to such perusal of my face As he would draw it. Long stayed he so. At last, a little shaking of mine arm And thrice his head thus waving up and down, He raised a sigh so piteous and profound As it did seem to shatter all his bulk And end his being. That done, he lets me go, And, with his head over his shoulder turned, He seemed to find his way without his eyes, For out o’ doors he went without their helps, And to the last bended their light on me. He grabbed me by the wrist and held me tightly, then backed a full arm’s length away. And, standing with his other arm raised over his forehead, he stared at my face as if studying it in order to draw it. He stood like that for a long while. Then, he gently shook my arm and glancing up and down three times, and sighed so sadly it seemed like he would collapse in on himself and die. Then he let me go, and walked away while staring back at me. He found his way out without looking away from me the entire time. Come, go with me. I will go seek the king. This is the very ecstasy of love, Whose violent property fordoes itself And leads the will to desperate undertakings As oft as any passion under heaven That does afflict our natures. I am sorry. What, have you given him any hard words of late? Come with me to see the king. This is clearly the madness of love, which is an emotion so violently powerful that it can destroy itself, leading people to act as desperately and insanely as often as any other emotion known to man. I’m so sorry. Have you said anything tough or unfriendly recently? No, my good lord. But as you did commandI did repel his fetters and deniedHis access to me. No, my good lord. But I followed your commands and sent back his letters and refused to let him see me. That hath made him mad.I am sorry that with better heed and judgmentI had not quoted him. I feared he did but trifleAnd meant to wreck thee. But beshrew my jealousy!By heaven, it is as proper to our ageTo cast beyond ourselves in our opinionsAs it is common for the younger sortTo lack discretion. Come, go we to the king.This must be known, which, being kept close, might moveMore grief to hide than hate to utter love.Come. That has driven him crazy. I’m sorry that I didn’t observe him more closely. I feared that he was just toying with you, and did not care if he wrecked your reputation. A curse on my suspicions! By God, it’s as common for us old people to think too much as it is for young people to think too little. Come, let’s go see the king. We have to make this matter known. Keeping it secret could cause more harm than revealing it. Florman, Ben. "Hamlet Translation." LitCharts. LitCharts LLC, 11 May 2014. Web. 22 Apr 2019. Florman, Ben. "Hamlet Translation." LitCharts LLC, May 11, 2014. Retrieved April 22, 2019. https://www.litcharts.com/shakescleare/shakespeare-translations/hamlet. 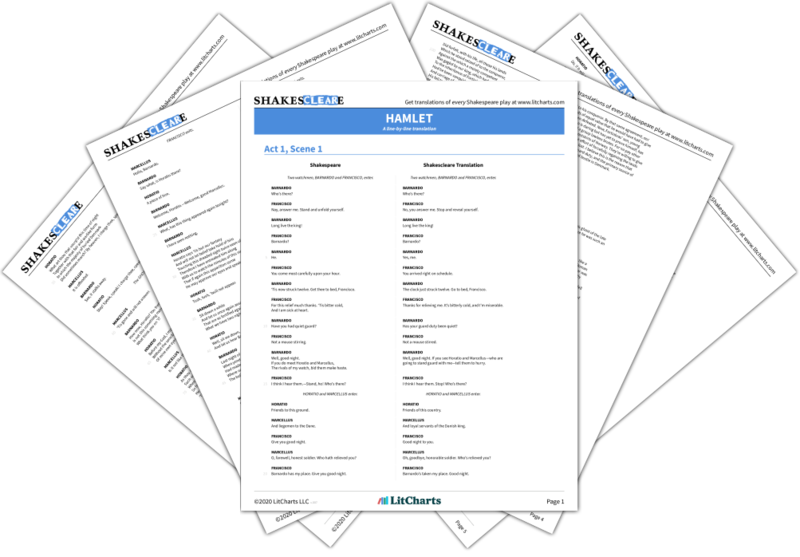 Join LitCharts A+ and get the entire Hamlet Translation as a printable PDF. 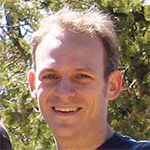 Ben is a co-founder of LitCharts. He holds a BA in English Literature from Harvard University, where as an undergraduate he won the Winthrop Sargent prize for best undergraduate paper on a topic related to Shakespeare.